If you think you’re missing out on the best of coffee bean flavors of their natural oils, then consider switching to French Press coffee. This simple way of brewing coffee is for those who like bolder flavor and don’t mind a bit of grit in their brew since there’s no paper filter involved. The best French Press coffee makers come with a good mesh filter to block grounds from passing through after the plunger presses down on them once steeping time is complete. Lovers of this style of brew know that paper filters used in the more popular drip coffee machines strip flavorful bean oils. Because the ground coffee beans steep in very hot water for 3-5 minutes, all the grounds are saturated and therefore you get a full flavored cup of coffee. In drip machines there is no steeping, so extraction of flavor is lower. Much depends on the coffee bean grind. It must be coarse because medium or fine grounds get clogged in the holes of the filter and that causes pressure to build in the carafe while hot coffee is being brewed and you risk the coffee spurting out to scald you and make a mess on your kitchen counter. If you grind the beans yourself, make sure you get a good burr grinder – either manual or electric, as blade grinders give you too much powder mixed with the coarser grounds and the heat generated also kills flavor. When shopping for a French press, you’ll have a choice of plastic, glass or stainless steel. We recommend sticking to either of the latter two, as plastic can wear out over time and tamper with the coffee flavor. Our best French Press reviews below cover both these types. Make sure that plunger and filter parts are also of stainless steel and not plastic. If you tend to wait a while before drinking your coffee then ensure that the model you choose retains heat well. Some models come in a variety of sizes to brew for more than two people at a time but some come in the standard 34 ounce (1 litre) capacity. Here are the best coffee presses available on Amazon. If you think that a drip coffee maker is more to your liking, we have our top picks of those too. Choose from simple manual pour over coffee makers and electric drip coffee makers. If you want to take your French press coffee to go, then we have our picks for the best travel French Presses too. Glass presses are great because you can see what’s going on in the beaker, but you have to be careful while handling it without its protective metal frame. A cheap press tends to have a thin glass beaker, which cracks more easily when you pour in the hot water. The Kona French Press Coffee Maker is the most art deco looking coffee maker of them all. The protective frame with handle doubles as a work of art and cradles the glass container safely for ease of pouring. It comes with a heat resistant borosilicate glass carafe, which is resistant to breakage as well as high heat, with the added benefit that glass keeps the heat in longer than some other types of materials. However, the glass will break if dropped from a counter top, so keep that in mind for absolute safety. The 3 piece infuser filter system is made of stainless steel. The Kona carafe is easy to clean. You can clean both the frame of the carafe and the press in the dishwasher, or merely rinse all of the parts clean, and you’ll be good to go for the next batch of coffee. It holds 34 ounces of liquid, which equates to about 3.5 8-ounce cups. It is versatile to use as a cold press or even for making loose leaf tea, and it is one of the lowest priced French Press coffee makers on this list. The glass SterlingPro looks like a modern version French Press coffee maker, with a plastic handle bolted to a stainless steel frame that securely holds the carafe. It features a round decorative button on the top of the lid which uniquely sets off this design. The “button” is actually the handle for the press, and even though it is one of the least expensive units here, it comes with 2 extra filter screens for the price. Best of all it features a twin-screen design, which literally catches even the smallest pieces of grounds before they make it into the coffee itself. This means that you can be less finicky about having consistent coarse ground beans. However, pushing the plunger at a fast rate may cause hot coffee to squirt from the spout, so be careful. Dishwasher safe or rinse clean, the borosilicate carafe holds 8 4-ounce cups of coffee, and insulates as well as any of the other glass carafes. Once again, it is made of glass, so rough housing this unit is not a good idea. The Bodum Chambord also resembles a modern day French Press coffee maker with the characteristic button top on the lid. In fact, it looks so similar to the above SterlingPro that you may mistake them for twins. With all of the parts rated dishwasher safe, the Bodum uses a 3-stage filter to capture all of the coffee grounds, but beware, it may let some of the finest grounds through. That said, even though the price is middle of the road, the coffee that it makes is as good as any and customers who have owned the SterlingPro say that the build on this one is sturdier. Made of borosilicate glass, the insulation properties rival the others, and it will serve 8 4-ounce cups of coffee. As with all of the glass carafes, you must be careful not to drop it or the carafe will break. 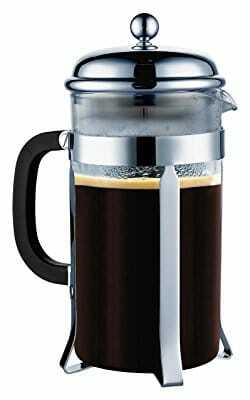 The Grosche Madrid French Press Coffee Maker is the highest priced glass unit here and for good reason. It has the thickest borosilicate glass carafe and made in Germany. It is thicker and therefore more break resistant, and it also is the best heat retaining glass French Press maker here. Of course, it costs more than the other makers, but if you like glass and both durability and heat retention are a priority, this one is the top rated French press. The flattened knob on the top of the carafe is the easiest to use when pressing coffee. The detachable carrier that the carafe sits in is chrome steel, with tip-grips that hold the carafe firmly in place while pouring, and the glass insulates so well that the handle won’t get hot when you reach for it. The unit itself actually resembles a glass jar more than a coffee maker, but it is true function over form and has a beauty all of its own. The dual filter design catches all of the grounds so none will end up in your pressed coffee, and it comes in three sizes, from 11.8 ounces, the 34 ounce as described here, and a big 51 ounce carafe. If you’re the clumsy kind, you’re better off owning a stainless steel coffee press instead of glass. You also don’t run the risk of anything cracking when you pour boiling water in. The disadvantage here is that you have to pre-measure hot water before pouring in as you can’t see the level to which it gets filled. The SterlingPro Stainless Steel French Press is one of the medium priced of the French Press units, but you’ll still get all of the advantages of more expensive ones. Double walled means the coffee stays hotter longer and it won’t break or shatter when dropped. Of course, it may get a bit hot if you don’t use the handle, so be aware of that especially if you have kids around. The flattened plunger knob on top makes it one of the easier to use stainless units here. This modern looking French Press looks like a standard coffee pot and s very easy to clean. Throw it into the dishwasher or just hand rinse clean. It comes in 3 sizes, 34-ounce, 51-ounce and 66-ounce, so you can choose which size fits your needs. The smallest press will give you 3.5 to 4 8-ounce mugs of coffee. It features a double screen system that completely keeps grounds out of your coffee. The cover is a bit loose fitting, so it loses heat a little bit faster than some of the other double-walled stainless steel presses. Keep that in mind if keeping your coffee hot is a priority. The Kuissential French Press maker is one of the least expensive units here, but it still boasts double wall construction with an 8-cup (4 ounce) capacity. It looks remarkably like the above SterlingPro, and it even has the flatted plunger knob at the top. Once again, it is stainless steel with polished outside finish and a brushed finish inside. Although double walled, the outside pitcher may get a little hot during use. Even though it really resembles the above listed coffee maker, it doesn’t have the same faults. The cover sits secure and keeps in the heat. Every component is dishwasher safe. However, it comes in an 8-cup 1 litre version only so it really is only meant for two people, or 3 people can stick to just one mug each. It also doesn’t come with spare filters like the SterlingPro above. The Frieling French Press is, by far, the most expensive coffee maker on this list, but it is also the most precise unit here too. The patented dual screen keeps grounds out of your coffee, even finer grounds, and the double walled construction is the thickest here, which means it is the best insulated French press and your coffee stays hot longer than in any of the others. Plus, since it is better insulated, you won’t have to worry as much about touching the outside because it will only be warm to the touch. At 36 ounces, it has a retro modern design that will fit well on any table or counter, and it also comes in 8, 17, 23 and 44 ounce versions as well. No need to worry about breaking this unit, but if it gets dropped, watch out for your toes. You can choose between a brushed or polished finish on the outside. Completely dishwasher safe, but the best part may be the 5 year limited warranty. Nothing on this list even comes close, so we rate this as the best coffee press in stainless steel. If vintage styling is the name of the game, then the Francois et Mimi is your only real choice on this list. And truly, what with the double wall construction and being dishwasher safe, it is a good choice. By a few pennies, this is actually the best cheap French press coffee maker here, but even for the price, it is a quality unit. A niggling feature is that when putting the cover on there is no way to tell which way it faces, so you may have to turn it and uncover the spout. That being said, the plunger is very efficient and lets few, if any coffee grounds into the brew, and this is the best dribble proof spout here. What is the best French press coffee maker for your needs? If you like the elegance of a glass carafe, any of the glass coffee makers would be a good choice, but the best one is the Grosche Madrid. Thicker than the rest, it insulates better and is not as breakable either. In stainless steel, the Frieling is tops. Nothing really comes close as far as coffee excellence and the best warranty, but you’ll also lay out some serious dollars to get one. Realistically, the Kuissential or SterlingPro would suit virtually all of your French Press needs, but if you want the best bang for the buck unit, the vintage styled Francois et Mimi can’t be beat. It has it all – style, efficiency, and a spout that won’t spill your brew.